I use this website to collect book reviews and comments from people that have read Advanced Web Metrics with Google Analytics. My official book website is at BrianClifton.com. As anyone who has tried writing a book will appreciate, such an endevour is not done for the money, but for the love and passion of the subject itself - knowledge transfer is what I attempt to acheive. Authors are always looking for feedback and praise is nice of course, but constructive criticism helps plan for future books. So if you have a comment about its content, structure, style, images (seriously anything! ), please post your feedback. 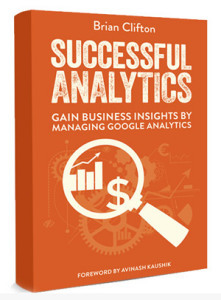 "This book somehow is perfect for both newbies to Google Analytics as well as experts. I read Brian's 1st Edition of his book about 4 years ago when I was just learning Analytics, and it not only brought me up to speed, I discovered I knew things others who had been doing Internet Marketing for years didn't know. I then read his 2nd Edition and relearned things I had forgotten. Now with the 3rd Edition (the best one of all) I am fluent in the new Analytics interface and reports, and I like the color reports he included. This newest edition has many more pages and the content not only shows how to do things, but more importantly it explains why." "Brian knows Google Analytics very well. He offers a lot of insights, tips and tricks. Stop losing hours and hours on forums, help etc... Read carefully this book and you'll become a deep expert of GA, and, last but not least, you'll be ready to pass the IQ Test! "It doesn't just explain the many, many features that GA has but gives you methodology for implementing the potential of the tool. So, whether you're looking for the basics, for more advanced segmentation and essential features like campaign tracking or the latest stuff such as multichannel funnel analysis, it's all there and in easily digestible form." "MUST to-do-read book for analytics practitioners: detailed, specific and easy-to use guide I strongly suggest the reading to everybody - at all the level- interested in GA and in analytics in general." "If you wanna learn Google Analytics well, you should learn from the best, and Brian Clifton certainly is one of the best. And if you - being an advanced or ambitious user in progress - are gonna buy just 1 book about Google Analytics, this is the one you should buy." For beginners and advanced users alike, buy this book! "I must say it is a monument to Google Analytics, a really beautiful book with an impressive amount of knowledge. It is certainly the most updated and complete piece of content on Google Analytics." "Not only was this book chock full of new information, it had some great code examples for the new version of Google Analytics. This is what I expect in a book titled "Advanced Web Metrics." I can get the basics online, in blogs, but Brian's books really help as a guide to going to the next level. Don't get me wrong there is a good balance here, with plently for those new to Google Analytics as well, including a lovely "Google Analytics in Color" section for those unfamiliar with GA. In short, this book I keep handy as my reference for the right answer on most questions and I cannot recommend it enough for those who are serious about analytics. " "Fantastic book for academia and professionals"
"For me, Clifton's textbook is more than just recommended reading; without doubt it is essential reading. As an academic I must choose one essential text and many recommended texts for each module I deliver. The reality is that it often proves very difficult to source detailed, relevant textbook material suitable for inclusion as a module?s essential text. This is particularly true for many 'web' related modules given the pace of change inherent in the field. 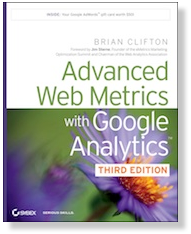 Having examined many related texts, I can confidently say that Clifton's 3rd Edition of Advanced Web Metrics is THE essential text for the Web Analytics module I teach at third-level". Lecturer at Institute of Technology Tralee, Ireland. "I just got my hands on the 3rd edition of Advanced Web Metrics, and I am happy to say it is a great update to the book. I have said for a while that anyone interesting in online marketing should start by reading Advanced Web Metrics. They then should go learn about all the functional areas of online marketing (e.g., paid search, SEO, email marketing, etc.) and then come back and read Advanced Web Metrics again. Metrics are the cornerstone of online marketing, and Brian Clifton just nails the subject. He does a great job of weaving high level concepts together with real world implementation. The 3rd edition keeps the book fresh and tackles a number of areas that have changed since the 2nd edition (e.g., the new Google Analytics interface). This is a fast moving area after all!" I include links here if you wish to know what people has said about the first edition and second edition of the books. Also, checkout my list of other reading material (books that have influenced me).